Once the blankets and bolts were removed, the astronauts inside the Cupola tested the shutters by opening them one by one. The first to be opened was the big Earth-facing circular window; its shutter swung open at 06:25 CET (05:25 UT). After seeing Earth through the largest window in space for a couple of minutes, the shutter was closed and each of the other shutters was opened for a short period to test they were working. Later all of the windows were opened simultaneously, providing a full panoramic view of Earth. With all the shutters opening without a problem, Cupola is now ready for use as a viewing tower. 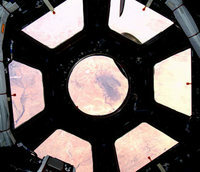 Positioned at the centre of the Cupola on the Earth-facing side, the seven windows provide a 360 degree view around the ISS – much better visibility than the helmet of a spacesuit. This view not only allows operations on the outside of the ISS to be observed and guided, but also affords scientific applications in the areas of Earth observation and space science, as well providing psychological benefits for the crew. 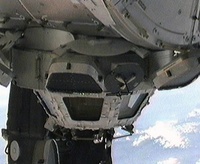 In addition to getting the Cupola ready, Behnken and Patrick activated a second ammonia loop to cool the newly installed Node-3 and disconnected some temporary power cables. The hatches between the ISS and the Space Shuttle will be closed at 09:19 CET on Thursday. Endeavour will undock from the orbital outpost at 13:35 CET to prepare for its return home, which is scheduled for early Sunday morning.